As an avid tennis player, I also enjoyed meeting Tennibot this week. The autonomous ball-gathering robot sweeps the court like a Roomba sucking up dust off a rug. In order to accomplish this task, without knocking over players, it navigates around the cage utilizing six cameras on each side. This is a perfect example of the type of job that an unmanned system excels at performing, freeing up athletes from wasting precious court time with tedious cleanup. Yet, Tennibot, at the end of the day, is a dumb appliance. While it gobbles up balls quicker than any person, it is unable to discern the quality of the game or the health of players. While Perceptive Automata is creating “predictive models” for outside the vehicle, few companies are focused on the conditions inside the cabin. The closest implementations are a number of eye-tracking cameras that alert occupants to distracted driving. While these technologies observe the general conditions of passengers, they rely on direct eye contact to distinguish between emotions (fatigue, excitability, stress, etc. ), which is impossible if one is passed out. Furthermore, none of these vision systems have the ability to predict human actions before they become catastrophic. 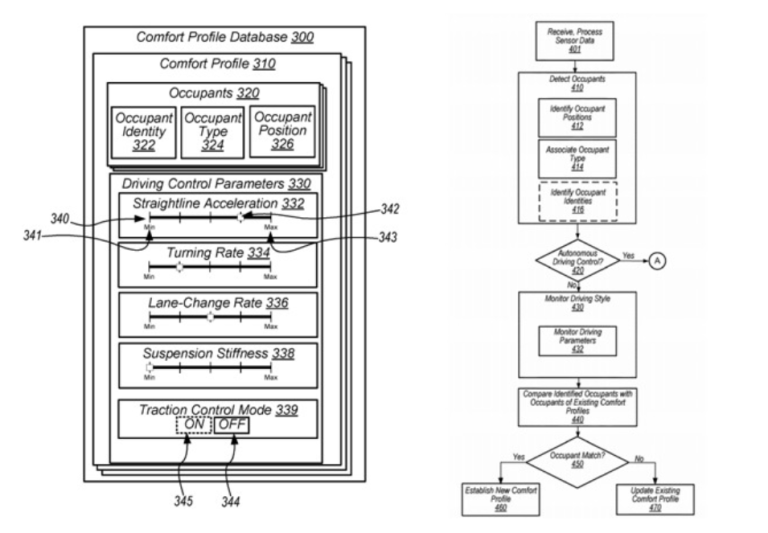 Litman’s view is further endorsed by the recent patent application filed this summer by Apple’s Project Titan team for developing “Comfort Profiles” for autonomous driving. According to AppleInsider, the application “describes how an autonomous driving and navigation system can move through an environment, with motion governed by a number of factors that are set indirectly by the passengers of the vehicle.” The Project Titan system would utilize a fusion of sensors (LIDAR, depth cameras, and infrared) to monitor the occupants’ “eye movements, body posture, gestures, pupil dilation, blinking, body temperature, heartbeat, perspiration, and head position.” The application details how the data would integrate into the vehicle systems to automatically adjust the acceleration, turning rate, performance, suspension, traction control and other factors to the personal preferences of the riders. While Project Titan is taking the first step toward developing an autonomous comfort system, Litman expresses that it is limited by the inherent short-comings of vision-based systems that are susceptible to light, dust, line of sight, condensation, motion, resolution, and safety concerns. Unlike vision sensors, Neteera is a cost-effective micro-radar on a chip that leverages its own network of proprietary algorithms to provide “the first contact-free vital sign detection platform.” Its FDA-level of accuracy is not only being utilized by the automotive sector, but healthcare systems across the United States for monitoring such elusive conditions as sleep apnea and sudden infant death syndrome. To date, the challenge of monitoring vital signs through micro-skin motion in the automotive industry has been the displacement caused by moving vehicles. However, Litman’s team has developed a patent-pending “motion compensation algorithm” that tracks “quasi-periodic signals in the presence of massive random motions,” providing near-perfect accuracy (see tables below). While the automotive industry races to launch fleets of autonomous vehicles, Litman estimates that the most successful players will be the ones that install empathic engines into the machines’ framework. Unlike the crowded field of AI and computer vision startups that are enabling robocars to safely navigate city streets, Neteera’s “intuition on a chip” is probably one of the only mechatronic ventures that actually report on the psychological state of drivers and passengers. Litman’s innovation has wider societal implications, as social robots begin to augment humans in the workplace and support the infirm and elderly in coping with the fragility of life.